Sarah Whittaker is a green-eyed beauty with a love for Danny Kaye and white knights. Lawyer Matthew Hope can see all this clearly, despite the fact that whenever they meet the two are under constant surveillance by the mental institution staff. You see, Sarah's crazy...or is she? Sarah pleads with Matthew to take her case, claiming that her mother wrongfully had Sarah committed in order to seize her inheritance money. And while the mother and doctors in question seem shady, almost cloying in their belief that Sarah is a paranoid schizophrenic, Matthew can't tell day from night, or Rose Red from Snow White. Meanwhile, the corpse of a woman about Sarah's age washes ashore in a town nearby. Is there a connection? Is Sarah Whittaker really pure as snow? Is she the Virgin Queen she says she is? It's up to Matthew to find out. 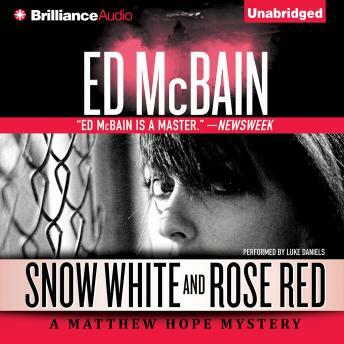 In Ed McBain's Snow White and Rose Red, Matthew Hope plunges into the noir, twisted world of the most complicated of mysteries - the human mind.